Planning a birthday party or other special event? 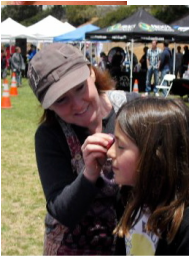 Make it picture perfect with professional face painting by Wild Faces! Tribal & tattoo style painting gets all of your guests involved! Mary has been working with kids for over a decade, and making San Diego's parties extra special since 2005. This is not an agency! Mary will be your artist, so you can be assured of great quality and service!